The first Falcon 1 rocket to fly undergoes a static fire test on its Kwajalein Atoll launch pad on March 21, 2006. This story was updated at 9:58 a.m.EST. After threefailed attempts, the private launch firm Space Exploration Technologies (SpaceX) is once more set to debut its Falcon 1 rocket in a Fridayspace shot. SpaceXofficials delayed the launch 24 hours to allow additional time to system checksand reviews. "We arefeeling more and more confident with each countdown attempt," said Elon Musk, founder of the El Segundo, California-based SpaceX, via e-mail from the firm's launch site. "It is alsoworth noting that four countdown attempts is actually a small number for abrand new rocket from a brand new launch site. Thetwo-stage Falcon 1 rocket is slated to launch spaceward at 4:00 p.m. EST (2100 GMT)from its equatorialstaging ground on the Kwajalein Atoll in thePacific Ocean's Marshall Islands. The launch window closes at 10:00 p.m. EST(0300 March 24 GMT), SpaceX officials said. A series ofengine tests over the last week have raised no serious issues, though SpaceX engineers are trying to cover all their bases. "Somepeople out here think that everything should work the first time, which is notrealistic," Musk said. SpaceX'sfirst Falcon 1 rocket is slated to orbit the $800,000 FalconSat-2spacecraft, a cube-shaped probe built by U.S. Air Force Academy cadets tostudy the effects of space plasma on communications and global positioningsatellites. The small spacecraft weighs about 43-pounds (19.5-kilograms) andmeasures 12.5 inches (32 centimeters) per side. The U.S. Air Force and DefenseAdvanced Research Projects Agency (DARPA) are supporting the $6.7 millionlaunch. FalconSat-2'smission has suffered three false starts due to technical issues. A computerglitch and liquid oxygen leak forced SpaceX launchcontrollers to abortan attempted space shot on Nov. 26, while a structural issue prompted a Dec.19 scrub. Unsatisfactory vehicle tests led to the thirdscrub. But each ofthose attempts also yielded valuable experience for SpaceXlaunch crews and flight controllers, Musk said. "Even ifthe launch is not completely successful, we will be able to gather a lot ofgood data," he added. Falcon 1 isthe first of a planned family of rockets which SpaceXhopes will ferry ever-larger payloads into orbit. 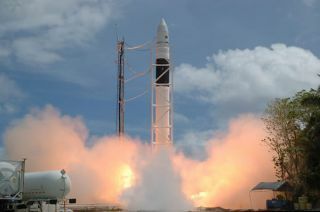 The firm is also developing aheavy-lift Falcon 9 rocket and its Dragonreusable crew and cargo capsule for servicing flights to the InternationalSpace Station (ISS). The firststage of Falcon 1 is designed to parachute to an ocean landing where it can beretrieved by recovery crews for later refurbishment and a future launch. Theliquid oxygen and kerosene-powered rocket stands about 68 feet (21 meters) talland is capable of delivering about 77,000 pounds ofthrust, SpaceX officials said. In additionto its Kwajalein Atoll launch site, the rocket isalso designed to launch from California's Vandenberg Air Force Base, where Muskexpects Falcon 1's second mission to begin.